Male hair loss is a very common problem, affecting over 6 million men in the UK. For some men, this can cause a real psychological impact, especially in young men or people who feel their appearance has been particularly badly affected by hair loss. In some instances, hair loss has been a factor in depression and low self esteem. Hair loss can be instantly ageing and change the appearance of the face dramatically. The most common type of hair loss is male pattern baldness, where hair is lost initially from the temples and crown. However, there can be other causes for hair loss including stress and hormone imbalances. 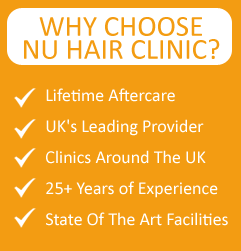 At Nu Hair Clinic, we have a range of treatments to help combat hair loss both surgically and with medications. Our team has over 25 years expert clinical experience with cosmetic treatments, so you can trust the advice we give you is based on sound experience and years of client care. Two types of FDA (Food & Drug Association in America) certified treatments for hair loss offered at Nu Hair Clinic are Rogaine and Propecia. While Rogaine is foam applied twice every day to prevent hair loss and encourage new hair growth, Propecia is a tablet ideal for men who have lost hair on the crown and back of the head. Follicular Unit Extraction and Follicular Unit Strip are the two types of hair transplants performed at Nu Hair Clinic. An innovative method of hair transplant called Follicular Unit Extraction (FUE) takes hair follicles from the nape of neck and transplants it to the thinning or bald area. Follicular Unit Strip is yet another relatively new technique that removes strips of hair from the back or side of the head and takes individual hair follicles and transplants them to the bald area. NU Hair Clinic has been in the forefront of hair transplantation solutions for men for their head through FUE and FUT, with high rate of success. Since the baldness problems are of major concern for people, there is a high turnout of patients for these issues, although we also help people with alopecia patches in other parts of the body. These may be due to the reasons of loss of facial hair due to diseases or for cosmetic reasons, such as having goatee or moustache. At NU Hair Clinic, we also offer Follicular Unit Extraction techniques for having full beard, especially if you are having a shape that you don’t like on your face. Some people do not grow beard with thick bushy appearance and would want to have such beard, which can be solved by our beard transplant procedure through the modern transplantation techniques. We also provide solutions for moustache transplantation at NU Hair Clinic, by implanting the follicles from the nape of the neck or back scalp onto the area of the moustache. This kind of procedure can be undertaken for someone wishing for a thick moustache or due to any issues to cover by having broad facial upper lip hair growth. Problems of the eyelids or other skin conditions can lead to loss of hair follicles of the eyebrow. We can successfully implant hair follicles at the eyebrow region to help in the regrowth of the hair at this particular point. From aesthetic point of view, our patients wish to get good eyebrows and we provide the services of eyebrow transplant for men at NU Hair Clinic. To add further impressive looks to the face, some men wish to get goatee transplant, which is done with fineness at NU Hair Clinic, so that there is a unique look on the face, while this process being undertaken with reasonable costs and without any ill effects on the skin or on the face. To allay any doubts from the minds of our customers and visitors to the site of NU Hair Clinic, we have detailed process depicted through the video on “How Hair Transplantation Works” along with videos from our customers, who have successfully underwent the process and are now living their life with the benefits of hair transplantation. Anybody aiming to know more about the process of hair transplantation for men, can actually learn a lot through the processes show in these videos to have a fair idea about the kind of transplantation, so that it is also easier to choose to go through the process.